Make lifting easier and less awkward! 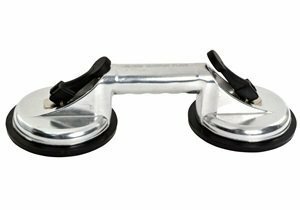 Attach this suction handle to glass, laminate, cabinets, countertops and other smooth, clean, non-porous surfaces to position a handle where you need it. Two flip-down tabs tighten the suction cups to the surface and lock in place. Handle is rated to hold up to 220 lbs. Bar-style handle is useful for vertical and horizontal applications. Caution: will not work on wood grain surfaces. Additional Information: Always test to make sure good suction is achieved before lifting. In extreme cold, the rubber suction cups will need to be warmed to function properly. If you have any questions about this product by KangRuiZhe, contact us by completing and submitting the form below. If you are looking for a specif part number, please include it with your message.